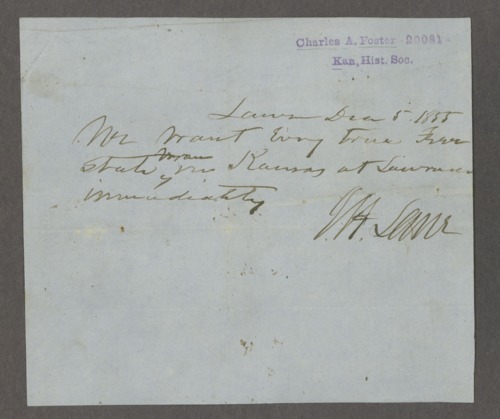 A note from James H. Lane to Charles Foster saying that every Free State man in Kansas is needed in Lawrence to help fight in the Wakarusa War. The "war" was averted by a treaty between Governor Wilson Shannon, Charles Robinson, and James H. Lane. Collections - Manuscript - Miscellaneous - Misc. : Fo - Foster, Charles A.